Brandon Tanev took the puck behind the Islander net and tried a wrap around that was stopped by Thomas Griess. The rebound bounced to the top of the crease where it bounced off the skate of Adam Lowry and in. From just inside the Jets blueline, Jordan Eberle fed a streaking Mathew Barzal, who moved into the slot before snapping a shot blocker side on Connor Hellebuyck and in. Nathan Beaulieu took a drop pass from Adam Lowry at right point and moved across the ice to the top of the left circle before dropping a pass to Brandon Tanev. He moved into the slot and snapped a shot over the glove of Griess and in. While on a 5-on-3 power play, Josh Bailey fed Ryan Pulock, who one-timed a slap shot that was redirected by Anders Lee at the top of the crease and beat Hellebuyck blocker side. While on the power play, Blake Wheeler fed Jacob Trouba at the point. He one-timed a slap shot that was redirected by Mark Scheifele in the slot over the blocker of Griess and in. Adam Pelech fed Ryan Pulock in the right circle who let a shot go that was stopped by the right pad of Hellebuyck, but the rebound bounced to Jordan Eberle at the top of the crease who knocked it in. Ryan Pulock took a shot from the right point that was redirected by Anthony Beauvillier that Hellebuyck got a piece of, but the puck trickled into the crease where Casey Cizikas knocked it in. From behind the Jets net, Mathew Barzal fed Jordan Eberle in the left circle. He faked a shot then moved to the top of the crease before firing a shot over Hellebuyck and in. Fall to 45-28-4 on the season, and 25-11-4 at Bell MTS Place. Are 1-2-0 on their current four-game homestand. Were outshot 44-37 tonight. 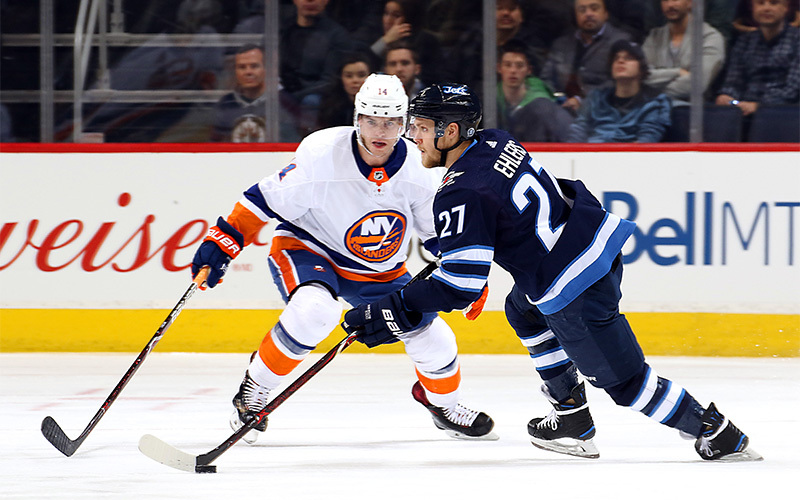 Jets have been outshot in five of their past seven games overall, and 11 of their past 12 home games. Gave up over 40 shots in a game for the 14th time this season. Fall to 29-9-3 this season when scoring first. Fall to 24-5-3 this season when leading after the second period. Had 17 shots in the first period, which is their third most this season. Had his second assist of the game in the second period to record his second multi-assist game as a member of the Jets (Mar. 3 at CBJ 5-2 W). Played in his 300th NHL game tonight. Led the Jets with five hits. Won seven of nine faceoffs tonight. Scored twice in the first period to end a nine-game goalless streak. Tallied his second multi-goal game of the season (Oct. 16 vs. EDM 5-4 OTL). Had an assist in the second period for his first three-point game of the season. Scored his team-leading 36th goal of the season. Won seven of eight faceoffs through the second period. Assisted both of Lowry’s goals for his first points in eight games. Registered his first multi-assist game of the season. Scored in the second period for the second three-point game of his career. Led the Jets with a career-high six shots. Registered two assists to give him 40 on the season. Has seven assists in his past six games. Led the Jets with 25:21 TOI. Led the Jets with two blocked shots. Assisted on Mark Scheifele’s third period goal, tying him with Marc Savard for most-assists in a season in franchise history with 69.